Keivan has always been fascinated with outer space. As a child, he wanted to become an astronaut, in order to study space "up close". Today, Keivan studies space--albeit from the ground--as assistant professor of astronomy at Vanderbilt University. "I thought if I couldn't go up into space, I would choose a profession that allows me to look up at the stars and ask the same kinds of questions, " he said. At Vanderbilt, Keivan's research has spanned everything from brown dwarfs and binary star systems to stellar and planetary formation. Through his research, Keivan is a participant in the Vanderbilt Initiative in Data-Intensive Astrophysics (VIDA), an initiative to make Vanderbilt a leader in fundamental astrophysics research by providing exceptional training for students through the use of the department's combined resources (such as new faculty, high-quality research telescopes, and high-performance computing). A further goal of VIDA is to make Vanderbilt University the national leader in the training of PhDs in physics and astronomy to underrepresented minorities--a goal which is self-evident among Keivan's collaboration (http://people.vanderbilt.edu/~keivan.stassun/crew.htm) and through other programs (http://people.vanderbilt.edu/~keivan.stassun/diversity.htm) So clearly, in addition to his research, Keivan is also passionate about his role as a mentor and educator--in particular about encouraging underrepresented groups to become scientists. Identified at a young age as a gifted student, Keivan attended the Sherman Oaks Center for Enriched Studies for middle and high school, and after a brief stint with the Navy (with the goal of becoming an astronaut), Kevian eventually decided to attend school at UC Berkeley, majoring in Astronomy. Keivan then went on to pursue his graduate degree in Astronomy at the University of Wisconsin, Madison. After completing his PhD in 2000, he spent a year helping to design, implement, and administer a new graduate fellowship program at Wisconsin which teamed science and engineering graduate students with local K-12 teachers to improve math and science teaching in schools. Keivan also spent two years at Wisconsin as Hubble fellow. 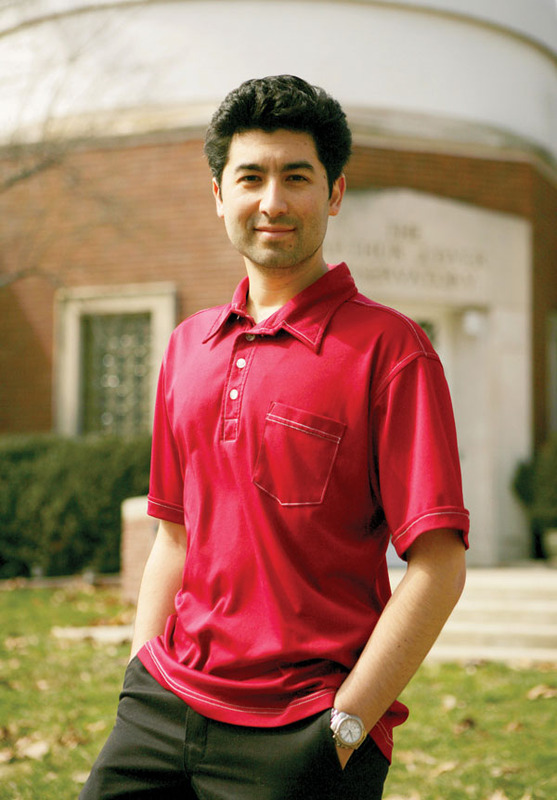 In 2003, Keivan moved to Vanderbilt, where he is currently doing a great deal of research on stellar formation and dynamics as an associate professor. He also holds an adjunct position at Fisk University. In addition to his abiding interest in physics and astronomy, Keivan also dabbled in theatre--as an actor, lighting designer, and even a stage manager--while he was an undergraduate at the University of California, Berkeley. Keivan was born on July 9, 1972, in Los Angeles, California. "I get my strange genetic admixture from my Mexican mother and Iranian father, " he said. Keivan lived in Venice until he was seven, at which point he moved to Encino in the San Fernando Valley ("The Valley"), which is the place he considers to be his "hometown." Keivan experienced some difficult times growing up, as his father left home when he was very young. "My mother set about gaining residency status and earning a high school equivalency. She worked cleaning homes...and we subsisted on food stamps and welfare. I attribute much of my drive in academics to my earliest memories of my mother studying late into the night for her equivalency and, later, for her citizenship." It was as a graduate student at the University of Wisconsin that Keivan's ideas about the importance of combining scholarly practices in research, teaching, and outreach began to crystallize. While carrying out his thesis research, Keivan became active in math/science education for minorities in the local schools, and developed an astronomy outreach program to provide teachers with resources related to teaching physics and astronomy. His role as a teacher and mentor remains an essential theme through his work at Vanderbilt, as he is is involved in several programs and publications at Vanderbilt aimed at underrepresented groups in physics and astronomy--such as the Fisk-Vanderbilt Masters-to-PhD Bridge program, and the American Astronomical Society (AAS) Committee on the Status of Minorities in Astronomy (CSMA). In addition to his family of students, Keivan enjoys spending time with his two sons, Emilio and Jaime, and his wife Justine, whom he married in 1994.